Leading whisky specialist Gordon & MacPhail, has today announced the launch of a limited-edition Linkwood bottling from 1956, which is believed to be the final remaining 1950s cask from the distillery. Private Collection from Linkwood Distillery 1956 by Gordon & MacPhail (49.4% ABV) is a 60 Year Old single malt Scotch whisky, from a single cask #20, which was laid down to mature at the Linkwood Distillery, on the 3rd of January 1956. Cask #20, is from a defining period in the company’s history. It was one of the last casks laid down by John Urquhart, first generation member of the family that owns Gordon & MacPhail, before he retired the following month. It was matured for six decades under the watchful eyes of John’s son, George, and subsequent generations until the decision to bottle was made by the fourth generation of the Urquhart family. Limited to just 53 decanters, this latest release from Gordon & MacPhail, is said to be an intricately layered whisky. Rich, warm aromas lend to a sweet full-bodied experience with highlights of blueberry, fruitcake, and dark chocolate. This latest release, is the second of four exclusive single casks unveiled as part of the ‘Private Collection’ range. 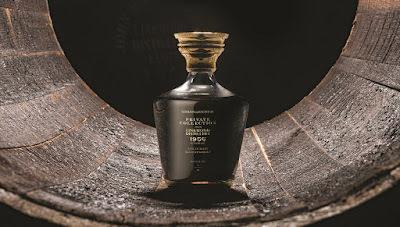 The first, Private Collection Glenlivet 1943 by Gordon & MacPhail, a rare wartime cask, was released in October 2017. Private Collection from Linkwood Distillery 1956 by Gordon & MacPhail, will be available later this month from specially selected, specialist retailers, for a RRP of £22,000.